McALLEN — With money flowing into city coffers thanks to a new utility fee and a bond election, the city has re-evaluated its approach to drainage improvements four months after storms damaged 2,700 homes in the city. “There are some projects that we didn’t have in our plan that we want the city commission to consider and would like to implement,” Roel “Roy” Rodriguez, the city manager, told city commissioners on Monday during a workshop where he said the utility fee will pay for six more drainage projects. 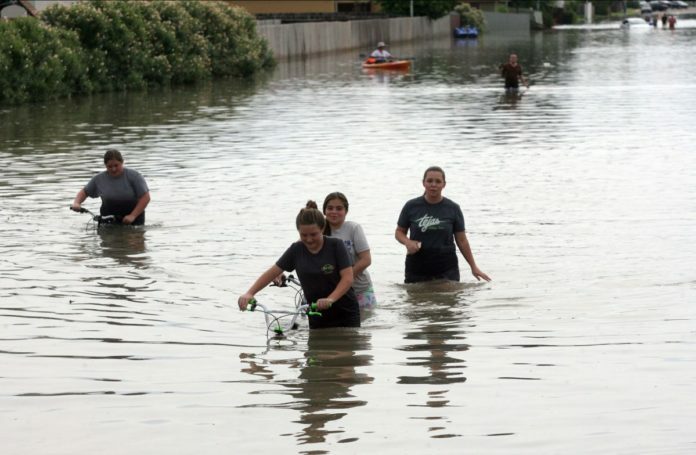 Yvette Barrera, the city engineer, laid out the six projects across the city, including a large one in south McAllen, a section of the city where residents had pleaded with city leaders for help after the June rains flooded parts of the colonias. Barrera also explained how, in addition to the utility fee, the upcoming Hidalgo County drainage bond, if approved by county voters on Nov. 6, could help with some of these projects. The utility fee was proposed by city staff, brought to the community in multiple public settings, unanimously approved by city commissioners and implemented in March. The fee has the average McAllen taxpayer shelling out $18 per year. City officials determine the fee for each resident based on property size. McAllen’s engineering department estimated the average residence in McAllen to be 2,700 square feet, which would amount to a $1.50 monthly fee on residents’ utility bill, or $18 per year. The fee for each property is determined by taking the total square footage of impervious cover at a property, dividing it by 2,700 — the average square footage of a McAllen single-family residence — and multiplying that number by $1.50. Impervious cover is everything on a property that is essentially an artificial structure. Examples of impervious cover include a garage, pool house, cabana or porch. The county appraisal district uses codes for every piece of impervious cover on a property. These codes appear on property tax bills. The city uses these codes to determine square footage of impervious cover on the property. Rodriguez said this fee will not be extended for more years because of the new projects. In May, McAllen voters approved a $22 million drainage project, which will be dispersed to 22 projects throughout the city over the next two years. Some south McAllen residents weren’t pleased about these 22 projects. Before an August city commission meeting, Valley Interfaith organized a group of people living in Balboa, Hermosa and Idela colonias to ask for help from city commissioners.